Mega Power Engine Treatment Product to remove sludge Contact Info: On a smartphone, to ask a question, or to order products listed, Call me at 512 665 3388.... george. Mega Power Engine Treatment To Remove Sludge. Uses the most powerful, most advance, yet safest, easiest method ever discovered to remove sludge safely. Does so quickly. In as little as 10 minutes - customer report. Recover's your motor's great performance again by healing damage sludge caused. This avoids $3000 + engine repair need to do so. Now, Science, Chemistry, and Mega Power gives you the POWER and MASTERY to Remove Sludge, Heal and Revitalize your engine. Saves your car and budget from being wiped out! Less that a 10th of the cost of a $3000 repair to do so. Easy addition to gas and motor oil, then lets driving complete the cleaning process. Not for $3000 Repair Cost to do So. Not even for $500 - No! Just $400 if a diesel. Just $200 if a gas engine car or pickup. Not guaranteed if an auction bought vehicle. Not guaranteed if you tried any other product, or home made concoction. Bearing noise requires new bearing. Comes with 6 items needed. 3 to easily, quickly clean and remove trouble causing sludge safely, Guaranteed! 3 to heal damage and restore trouble free performance, guaranteed! Avoids $3000 + - engine repair need Guarantee. Gives you the POWER and MASTERY to Fix and Revitalize. 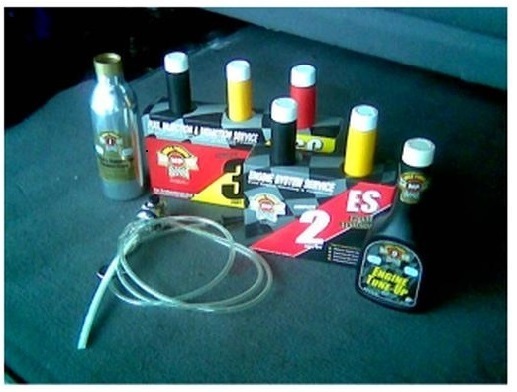 Do so by easy addition to gas and motor oil, and lets driving complete the cleaning process. Oil change required after one week. Made and installed to keep good running vehicles running great with the best protection you can buy. Also available for transmission radiator steering and a/c components, providing a whole second life time those components usage. And better resale. Free anytime phone tech help if needed. The 6 items $200 Shipped to your door in 3 days by Fedex. Click cart button to purchase. Mega Power is liked for its engine cleaning, revitalizing and other engine flush features tmade to restore your dirty engine performance. Something other brands have not figured out. This Mega Power Product Advantage stops tapping, oil burning, and blow-by. All results of sludge presence. The ingredients - The 6 superior cleaners shown, are installed in 2 steps to the fuel and oil. Mega power is more than a rinse. Its a Cleaning Treatment. Which makes it different from other engine quick flushes. Features complex cleaning ingredients that go where even oil can't, Mega Power ends binding of your engines parts avoiding need for costly engine tear down, cleaning and rebuild. Features Friction Modifiers - an exclusive ingredient, worn surfaces smooth out, and heal any damage to piston bearings valves and gears. Another reason Mega Power features promote a fast return of your motor's lost performance. The instantly smooth running gives reason to end the worry about it. Features Driving as part of the process. Features Specialized cleaners. 3 items are install. Vehicle is driven for a week. 3 others are added at an oil change a week later to continue cleaning and additional recovery. Features: This advantage stops tapping, oil burning, and blow-by. Avoids future avoidable problems and to save your engine and your money. Another way Mega Power is superior. You benefit: Nothing to take apart, yet easy to do. Thousands in repair avoided. Both men and women car owners can follow the directions. Not just for mechanics. Mega Power Engine Treatment Product to remove sludge. The Results are Different - This completes the cleaning, and performance recovery as you drive process will have your motor purring like a kitten. But perform like a race horse! And you don't have a $3000 repair bill! The benefits: The cleaning results begin in 10 minute. The motor will start, run, as if newer, have race car zip. Running performance improvement continues as you drive. 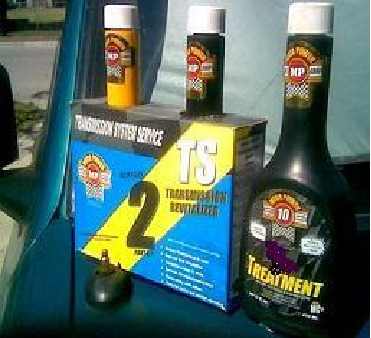 Protectors and conditioners do their thing to extend engine life as you drive. You do it yourself for less! You learn a new way to both stop and prevent car troubles for the rest of your life! If you read this far, its the product you need to remove sludge! Any other method without these features are harmful! Ordering: Mega Power Engine Treatment To Remove Sludge. Mega Power Engine Cleaning Treatment. Free phone help if needed. Avoids $3000 + engine repair Guarantee. Gives you mastery to Fix and Revitalize. Shipped to your door in 3 days by Fedex. Product shown from Mega Power to remove sludge in transmission and correct rough shift. Or prevent problems in good transmissions. A 25,000 miles service product. Add item shown, the pre-cleaner, to transmission. Run or drive up to and hour. Drain old fluid. Replace with new. Add 2 remaining cleaners conditioners to the new fluid. Some repair shops and quick lubes have a machine to do this. Just tell them to follow directions included. DIY directions also included. If this Mega Power Product to Remove Sludge sounds good to you - tens of thousands already satisfied users, order one or more treatments below. Works in transmissions just a s well - to correct and prevent shift troubles. The ingredients: method for the goo removal. With other products, a 5 minute rinse is required. You drain out oil, add their flush additive. Can't drive while the solvent is in the motor. Product labels have other warnings, such as: "don't even rev up the motor while the flush is in the motor, or engine damage will occur. Add 3 cleaning ingredients shown to gas and oil. Drive normally for a week. A week later, do an oil change where you add the other 3 cleaners and conditioners. Drive normally and results should have your motor purring again. Do an oil change at 3000 miles. No need to dismantle engine for overhaul. Our product removes sludge affecting moving parts and oil passage ways . to get to the rings, valves, and their lifters - to quiet their tapping - and guarantee assured lubrication to prevent failure. We feel this is most important at this point in your engines life. If they looked at your motor, their news is expensive. A week or 2 without your car, as the steam clean every part, do machine work, replace any suspect parts. A mere $3,500 to $5000 is the price range to do all that! No wonder Google or Bing sent you here. Our method is under $100 for cars and pickups, under $400 for heavy equipment and big diesels. That a fraction of what mechanics charge - but you do get a complete rebuild with them. Our method chemically reverts the running clean-like operation of your motor - and transmission if you giver it the same service, like it ran years earlier. A special lube aid called MC+ goes along with the cleaner and has the feature to free and smooth surfaces. This clean, free smooth advantage takes away the strain on moving parts sludge is causing. Engine product to remove sludge easily ordering info. The sludge just sitting elsewhere. but not affecting anything is not removed that quickly. That's a big difference in ideas. Those are big improvements in products to remove sludge - that are safe, fast, better, and isn't that what you want? Order Now! In a few days get back on the road of life again with a clean operating motor again! if this sounds good, you can order the product below. it comes with a satisfaction promise or your money back! Please note: 2 refunds last 267 days. For techie types read the rest of the page. Ordering Mega Power Engine Treatment Product to remove sludge is easy. Mega Power comes with 6 items needed, Includes easy-to-follow-directions, phone help if needed, guarantee. shipped to your door in 3 days by Fedex. Just $84 +$15 s&h total + $99 Click cart button. The common, and new method to end motor blowby, piston blowby, compression and combustion decline - and restore great engine performance again. The mechanic's way to end motor blowby is to spend a day or two dismantling your engine, cleaning and inspecting every part, ordering new parts needed, and having the engine heads sent to the machine shop for rebuilding. Then several days of reassembling and $3000 or more of your money given to him gets your car going again. The other way to end motor blowby. A simple 2-step treatment from Mega Power is the new, very effective, high tech chemical way to end blowby - for under $200, if a mechanic installs the product. Under $100, if you install Mega Power yourself. I'll show you how to install Mega Power and end your blowby - its easy, and driving does the actual fix. Nothing to take apart. The method, tips and product is sold 100% guaranteed - just in case some other, more serious concern shows actual overhaul is needed - which, if Mega Power fails - pretty much assures you of that need. Mega Power is working 95 times out of 100 tries lately. So that is a good value, for sure! Step One. Mega Power starts with Step One: by cleaning the 6 dirty motor conditions that increase blowby. Because motor blowby is causes by these 6 other dirty conditions in 6 areas of your motor, Mega Power has developed 6 cleaners and conditioners that travel with your fuel, air, and motor oil to removed those dirty conditions - thereby ending the cause of your motor's blowby. Step Two takes place a week later during an oil change. A pre-cleaner added 10 minutes before your oil change liquefies and removes piston ring, valve adjuster, oil lines, and bearing residue and neutralizes acids. Best product to remove sludge.